Haldirams Soan Papdi 200 Gms. Send this Diwali Gift Anywhere in India. This special Diwali Gift will make your loved ones feel happy . Haldirams Soan Papdi 400 Gms. Send this Diwali Gift Anywhere in India. This special Diwali Gift will make your loved ones feel happy . 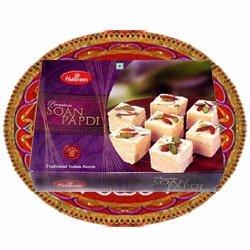 Haldirams Soan Papdi 800 Gms. Send this Diwali Gift Anywhere in India. This special Diwali Gift will make your loved ones feel happy .